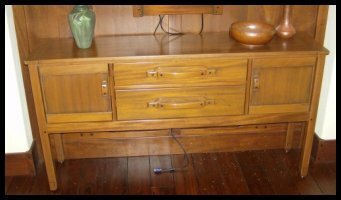 Below are several examples of our handcrafted Bookcases, Dressers, Stereo and Entertainmant cabinets and home office furnishings. Some of these are reproductions of classic Arts & Crafts designs while others are adaptations to suit the needs of the modern home. 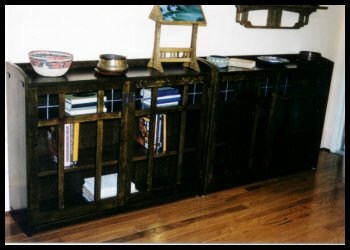 In all cases we have utilized traditional joinery and materials to underscore the origin of each item firmly within the boundaries of the Arts & Crafts Movement. We offer a wide range of standard finishes and will be happy to match samples or existing furnishings. Please do not hesitate to contact us with any questions or requests. Available in a variety of sizes, configurations and wood species. 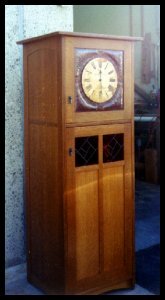 Fitted with antique style leaded glass and hammered copper pulls. 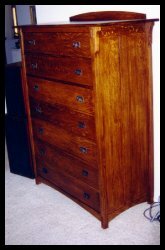 Quarter sawn white oak with dovetailed drawers and handcrafted pulls. Theme pieces like this can really set the mood for a room. 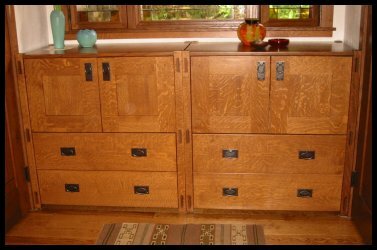 We can incorporate similar Arts & Crafts themes into a variety of furnishings and built-ins. 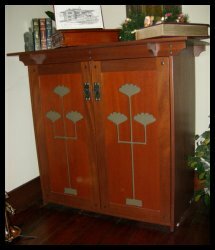 A pair of early Stickley Craftsman style "Lowboy" Bookcases in quarter sawn white oak. 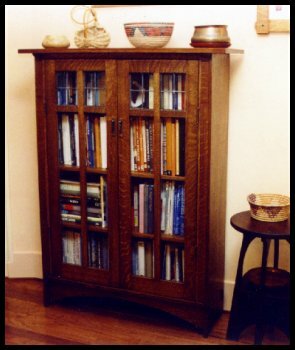 These lovely bookcases really work well under windows or art work. Available in a variety of sizes & finishes. 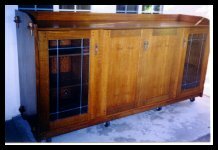 Custom handcrafted Entertainment center in the early Stickley Craftsman style. 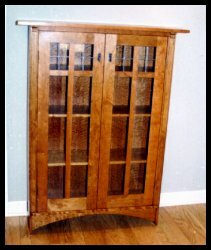 Quarter sawn white oak with "bow tie" inlays in pocket doors and leaded glass bookcase doors. 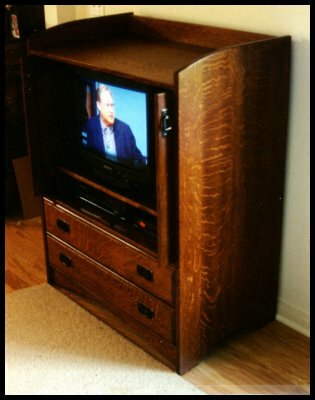 Mission style quarter sawn white oak TV cabinet with media storage drawers. This classic Arts & Crafts inspired design is available in other sizes and configurations. 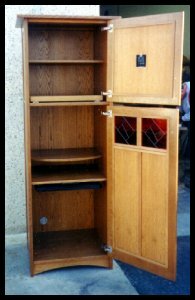 Companion LP storage cabinet inspired by an early Stickley Cellerette designed by Harvey Ellis. a special request. 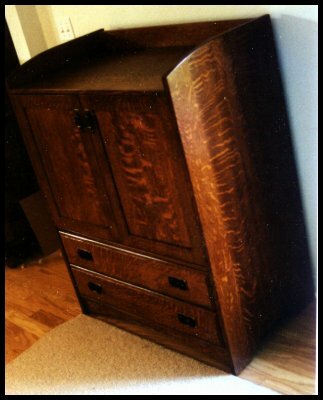 This cabinet was the result. A full size processor, monitor, keyboard and printer fits right in. There is even room for paper and supplies. Try and find this somewhere else! 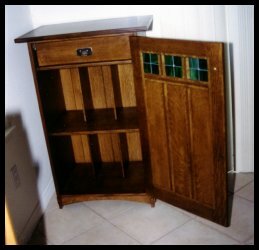 This performs two separate functions ... first as a hall table and then as a electronics cabinet. It houses a PC and DVD player which run a picture-mirror mounted directly above. 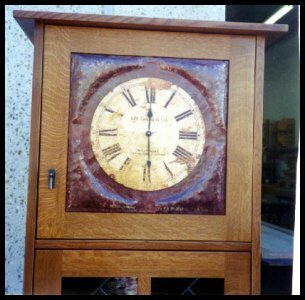 Over the years we have created many unique casework items for our customers. 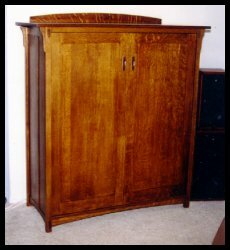 to stereo cabinets with media storage and home office cabinets. All inspired by the classic designs of the Craftsman & Mission Era. A few of these are shown on this page. If you do not see exactly what you are looking for please contact us. We will be happy to design a piece specifically for your home.